Jalen Mills made significant improvements in his second year in the NFL. Now that the Philadelphia Eagles' offseason is (finally) underway, let's take a look at each position and figure out which players will be back in 2018, and which ones will be playing elsewhere. Here we'll look at cornerback. Mills was among the Eagles' most improved players in 2017, as he became a legitimate NFL starter on the outside. On the season, he had 64 tackles, 3 INTs, 14 pass breakups, and eleventy billion finger wags. At some point, the Eagles may move Mills into a safety role, but for now, he'll be right back at corner in 2018, and he has proven to be a steal in the 7th round of the 2016 NFL Draft. 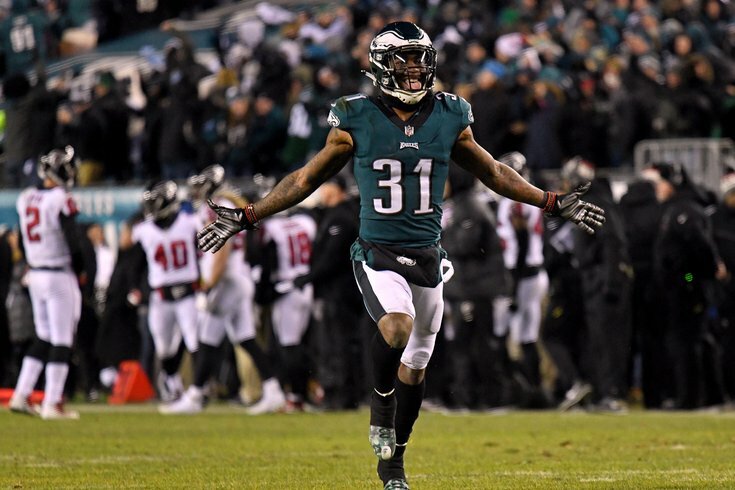 Jalen Mills: Stay or Go? After suffering what looked like a gruesome injury Week 1 against the Washington Redskins, Darby returned to the field Week 11 in Dallas. He had his bad moments (vs. the Giants Week 15) and his good moments (his INT vs. the Raiders flipped the likely outcome of that game). With a full offseason in Jim Schwartz's scheme, and no injury setbacks, it's fair to expect that Darby should be more consistent in 2018. MORE ON THE EAGLES: Report: Eagles promote Mike Groh to offensive coordinator | This is the year for the Eagles to play the 'compensatory pick game' | Insane Nick Foles trade take tracker | Howie's choice: Do the Eagles keep Nigel Bradham or Mychal Kendricks? | Mailbag: What could the Eagles reasonably expect in return if they traded Nick Foles? Ronald Darby: Stay or Go? As we noted in our compensatory pick piece this morning, Robinson signed as a Band-Aid three weeks after the start of free agency began last offseason, and then proceeded to have a career year as the Eagles' slot corner. He was perhaps the steal of free agency a year ago. Now that his stock has risen, Robinson is poised to cash in on the open market this offseason. In free agency, corners get paid. It will be interesting to see what Robinson gets, but it will almost certainly be somewhere else. Patrick Robinson: Stay or Go? Jones rehabbed nearly the entirety of the regular season, before he got a chance to play in the Eagles' meaningless finale against the Dallas Cowboys. Here's a recap of that performance, with gifs and stuff. A number of experts thought Jones was the most talented cornerback in the 2017 draft class. We'll see this year if he can make an impact after being fully recovered from a ruptured Achilles. Douglas appeared in 14 games, starting five. He had 25 tackles, 2 INTs, and an impressive 11 pass breakups in limited action. As you might expect of a rookie, there was good and bad, but the big stage didn't seem too big at all for Douglas. At a minimum, he'll be a quality fourth cornerback for the Birds in 2018. Rasul Douglas: Stay or Go?